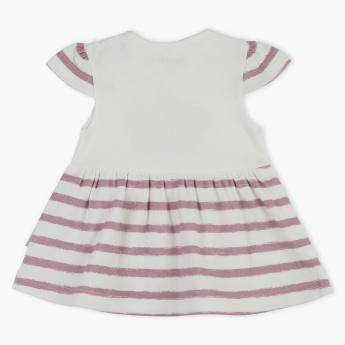 Dress up your darling in this adorable dress with stripes and print. Made of soft fabric and apt length, this dress will keep your darling at ease throughout the wear. The cap sleeves and shoulder opening ensures ease of changing. Features : Shoulder opening girls dress with cap sleeves for easy dressing .